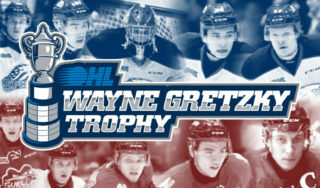 An action-packed weekend of OHL action is fast approaching. Here’s a look at what’s happening across the league. 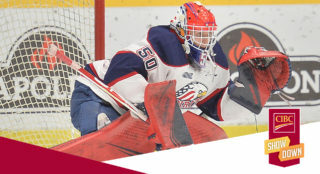 Ryan Suzuki (Barrie Colts), Matvey Guskov (London Knights), Arthur Kaliyev (Hamilton Bulldogs), Michael Vukojevic (Kitchener Rangers) and Nick Robertson (Peterborough Petes) are included on Sportsnet’s October Rankings for the 2019 NHL Draft. The list compiled by Sam Cosentino features Suzuki leading the way at 14th overall. Read more at sportsnet.ca. The Don Mills Flyers Minor Midgets are champions once again. After winning the Toronto Titans Minor Midget Tournament last month, the Flyers marched to the Championship of the Wendy Dufton Memorial Tournament in London, Ont. to defeat the Toronto Marlboros 6-1. Brennan Othmann led the event in scoring with 25 points (16-9–25) in eight games while underage standout Shane Wright trailed with 17 (7-10–17). The fifth annual edition of the Rogers Hometown Hockey Tour got underway in Kitchener last weekend. The Rangers helped launch the 50th Oktoberfest celebration with specially-themed Oktoberfest jerseys on Friday as they played host to the Saginaw Spirit. 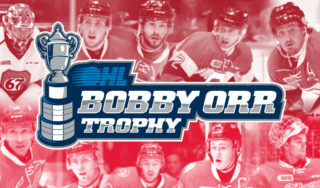 The first of 25 stops across the country featured stories and appearances from former OHL talent in Scott Stevens (New Jersey Devils/Kitchener Rangers), Mark Scheifele (Winnipeg Jets/Barrie Colts) and Ben Fanelli (Kitchener Rangers). For more on those stories visit hometownhockey.com. Colts take on troops from CFB Borden in support of Soldier On: The Barrie Colts laced them up against soldiers from CFB Borden on Tuesday, supporting Solider On, a Canadian Armed Forces program committed to supporting veterans and serving members to adapt and overcome permanent physical injuries or mental healthy issues. The Colts will be holding an upcoming home game on November 15th in support of the cause. For more details visit barriecolts.com. 67’s receive visit from Team Canada Blind hockey captain: The Ottawa 67’s got a visit from the captain of Canada’s Blind Hockey team Kelly Serbu last week. Kelly and Team Canada will be traveling down to Pittsburgh this weekend for the first ever international Blind Hockey series against the US. Prior to his departure Serbu stopped by 67’s practice on Friday to talk to the team about his journey and what #NoQuit means to him. He then went out on the ice with the team, bringing his own puck and played some Blind Hockey with the Barber Poles. He was also at TD Place on Saturday for the ceremonial puck drop where he dropped the Blind Hockey puck the team had used the day before. For more on the story visit ottawa67s.com. 67’s suit up in REDBLACKS jerseys on Sunday: It’s no secret that the 67’s play their games underneath a football stadium. On Sunday afternoon they’re bringing the football underground into The Arena at TD Place for an RNATION game against the Erie Otters. REDBLACKS players Greg Ellingson, Diontae Spencer, William Powell will be in attendance for the game, helping out with the ceremonial faceoff. Full details at ottawa67s.com. IceDogs to honour Stan Mikita, don Tee-Pees jerseys on Thursday: The Niagara IceDogs will suit up in Tee-Pees jerseys for warmups and a special pre-game ceremony on Thursday at home to the Barrie Colts, saluting legendary star Stan Mikita who passed away this past summer. For more details visit niagaraicedogs.net. Petes prepare for Alumni Homecoming Weekend: On Saturday, October 13 at 7:05pm more than 65 Petes alumni will be in attendance for a game against the Windsor Spitfires as part of Alumni Homecoming Weekend. A special pre-game ceremony will celebrate the 40th anniversary of the 1979 Memorial Cup Champion Petes, in which nearly the whole team will take part. For full details on an exciting weekend, visit gopetesgo.com. Eventful weekend in Flint: The Flint Firebirds have a pair of home games this coming weekend and there’s lots to do at the Dort Federal Credit Union Event Center. The Birds will host ‘810 Night’ on Friday against North Bay, celebrating the Greater Flint Area as they offer the lowest individual ticket prices in franchise history. The first 810 fans in attendance will receive a free Firebirds ‘810’ shirt. The Kitchener Rangers are in town on Saturday as the club salutes First Responders, giving them $5 off a silver level ticket. Admission to the Firebirds’ game earns fans a ticket to the ‘Battle of the Badges’ game between the Police & Firefighters that takes place beginning at 4 p.m. with doors set to open at 3:30 p.m. Full details at flintfirebirds.com. Spirit host Star Wars Night, Post-Game Skate: The Saginaw Spirit host a pair of home games this weekend, battling the North Bay Battalion on Star Wars Night Saturday at the Dow Event Center. Fans are encouraged to wear their Star Wars apparel to the game. The Spirit will host a post-game skate after their game on Sunday. Full details on the upcoming weekend can be found at saginawspirit.com. Superhero Night in Hamilton: The Hamilton Bulldogs host Superhero Night on Saturday at home to the Mississauga Steelheads. Wear your favourite costume and get in on the fun! Svechnikov scores first NHL goal: Barrie Colts graduate and 2018 CHL Top Draft Prospect Andrei Svechnikov scored his first career NHL goal with the Carolina Hurricanes this past week. Svechnikov lit the lamp in Carolina’s 8-5 win over the New York Rangers on Sunday. The 18-year-old has four points (2-2–4) through his first four NHL games. Svechnikov was the second overall pick of the 2018 NHL Draft after registering 72 points (40-32–72) in 44 games with the Colts last season. Anderson, Cherry, Smyth named to AHL Hall of Fame Class of 2019: Former OHL contributors both on and off the ice, John Anderson, Don Cherry and Brad Smyth have been named to the AHL Hall of Fame’s Class of 2019. Anderson was a centrepiece of the OHA’s Toronto Marlboros from 1973-77, winning a Memorial Cup in 1975 before a lengthy NHL career spent largely with the Toronto Maple Leafs. In addition to his time on the blue line with the Barrie Flyers from 1952-54, Don Cherry won four Calder Cup titles before stepping behind the bench of the Boston Bruins from 1974-79. Joining the Hockey Night in Canada icon is Brad Smyth, a London Knights graduate who played over 600 career AHL contests, recording 667 regular season points while winning a Calder Cup with the Hartford Wolf Pack in 2000. For more on the 2019 induction class, visit theahl.com. Panthers recall Lammikko: Kingston Frontenacs graduate Juho Lammikko has gotten the call from the Florida Panthers. The 22-year-old spent the past two seasons with the AHL’s Springfield Thunderbirds after being a third round pick of the Panthers in 2014. He played two seasons in Kingston, recording 99 points (40-59–99) over 123 regular season games. Pu settling in nicely with new team: Kingston Frontenacs graduate Cliff Pu is getting familiarized with his new surroundings. The Carolina Hurricanes prospect has made the jump to the pro ranks, starting the 2018-19 season with the AHL’s Charlotte Checkers. Originally a third round pick of the Buffalo Sabres in 2016, Pu was dealt to Carolina in August as fellow OHL grad Jeff Skinner went the other way to Buffalo. Pu played four OHL seasons between Oshawa, London and Kingston, winning a Memorial Cup with London in 2016. Read more on his early season story at buffalonews.com. Bitten dealt to Minnesota: Hamilton Bulldogs graduate and 2018 OHL champion Will Bitten was traded to the Minnesota Wild last week. Previously with the Montreal Canadiens, Bitten was swapped for Swedish defenceman Gustav Olofsson. A 20-year-old from Gloucester, Ont., Bitten played four OHL seasons between Plymouth, Flint and Hamilton, recording 217 points (88-129–217) over 257 regular season games. He picked up 11 points (4-7–11) in 21 games during the playoffs last spring. He was a third round pick by Montreal in 2016. Maletta announces retirement: Niagara IceDogs graduate Jordan Maletta has announced his retirement at the age of 23. Maletta, who was involved in an offseason trade to the Chicago Blackhawks that sent injured forward Marian Hossa to the Arizona Coyotes, was hampered by a hand injury throughout the 2017-18 season. He wasn’t medically cleared to play prior to the 2018-19 campaign and formally announced his retirement last week. The St. Catharines, Ont. native played five OHL seasons between Windsor and Niagara, appearing in 314 career regular season games. He helped the IceDogs win an Eastern Conference title in 2016 before being signed as a free agent by the Columbus Blue Jackets. Baker officiates first NHL contest: OHL officiating graduate Tyson Baker worked his first career NHL contest on Tuesday in Ottawa. Baker, who officiated in the OHL last season worked as a linesman on Tuesday alongside a crew that included Scott Driscoll and referees Eric Furlatt and Pierre Lambert. Baker was one of three OHL officials hired by the NHL this past offseason, joining Mitch Dunning and Michael Markovic. Baker cites current OHL officials Kevin Hastings and Dustin McCrank as his primary mentors in development. Sandlak joins officiating ranks: OHL graduate Carter Sandlak has transitioned into life in stripes. A former power forward who played five OHL seasons between Guelph, Belleville and Plymouth from 2009-14, Sandlak played four seasons in the professional ranks between the AHL and ECHL and has taken up a new career as an official. Following in the footsteps of former OHL teammate Cory Syvret, Sandlak will serve as a linesman in the ECHL and a referee in the OHL and AHL. For more on Sandlak’s story, visit echl.com. A Central Division rivalry just got a whole lot more interesting. The defending Central Division champion Barrie Colts visit the surging Sudbury Wolves on Friday night in what looks to be a closely-matched contest. OHL scoring leader Ryan Suzuki and the Colts got the better of Sudbury in their first meeting on September 27th, taking a lopsided 10-3 win before losing to the same Wolves club a few nights later by a score of 3-2 in overtime. The Wolves made their Kia CHL Top 10 Rankings debut this past week, coming as the eighth-ranked team in the country. 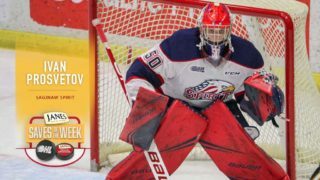 OHL ‘On the Run’ Player of the Week Ukko-Pekka Luukkonen sports a perfect 5-0 record between the pipes. The Storm and the Sting treated fans to a dandy of a game last weekend in Guelph. The two clubs meet again on Saturday in Sarnia. Ryan Merkley set up Nate Schnarr for the last second game winner as the Storm edged the Sting 6-5 on Friday night. The back-and-forth affair saw the Storm overcome a 4-2 deficit as Schnarr and teammate Isaac Ratcliffe both scored twice. While the Storm enter the week as the ninth-ranked team in the CHL, the Sting have dropped three straight decisions after starting their 25th season 3-0. Veterans Anthony Salinitri and Adam Ruzicka have led Sarnia offensively, each producing six points on the campaign.